AKIPRESS.COM - Eight people have been killed and dozens injured as a lorry crashed head-on into a Greyhound bus in the US, BBC reports. 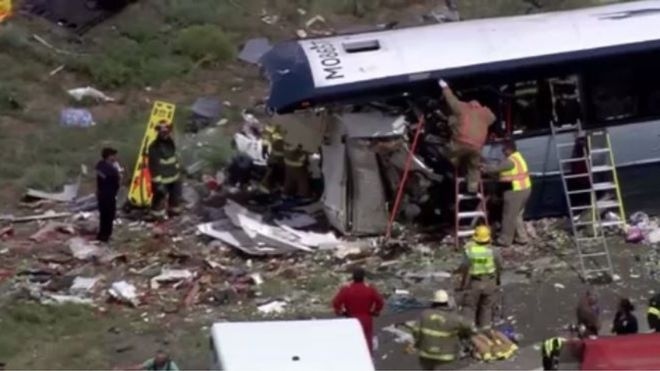 Forty-nine people were on the bus at the time of the collision on Thursday afternoon on a highway near the town of Thoreau, New Mexico. New Mexico State Police said a tyre on the lorry apparently blew out, making it swerve into oncoming traffic. The tragedy came as millions of Americans prepare to celebrate the three-day holiday weekend of Labor Day. Rachel Cunningham told CBS News she was asleep on the Greyhound at the moment of impact. "It was horrifying," she said. "Like, I've never actually seen in my life a bus look like a ripped-open sardine can." The truck driver sustained non-life-threatening injuries, according to local media. The Greyhound bus had departed from St Louis bound for Los Angeles, via Phoenix, Arizona. It had stopped in Albuquerque just before the collision, the company said. "Our first priority is taking care of our passengers and their families as this incident has deeply impacted all involved," the company said.